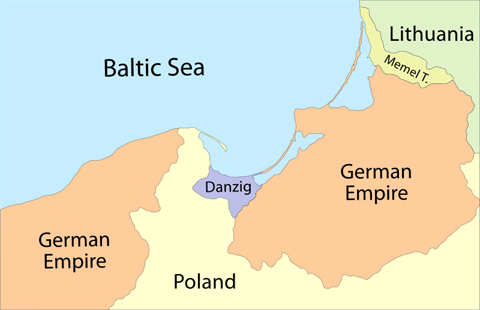 Germany had occupied Danzig since 1870 and it was predominantly German speaking. Poland, which ceased to exist in 1795 as a fully independent state because of a series of invasions and partitions by the Kingdom of Prussia, the Russian Empire and the Habesburg Monarchy was reborn in 1918 and was known as the Second Polish Republic. The League of Nations in the Treaty of Versailles of 1919 chose to create The Free City of Danzig, or Wolne Miasto Gdańsk in Polish splitting Germany in half by not only Danzig, but the newly formed country of The Second Polish Republic/Poland. Danzig (Gdańsk) was put under a commissioner appointed by The League of Nations. Despite the male population fighting fiercely to remain part of Germany, the Reich had to denounce all claims on Danzig thus allowing it to become a Free State. Danzig benefited from it’s own harbour and ability to trade with the world, but Poland resented having to also sign away it’s claim, and using French money set up a new port for itself and tried to ruin Danzig by avoiding using it’s harbour. By 1933 over 42,000 people were unemployed and Poland continued to attempt to force Danzig to fall into it’s hands, but the people fought back to remain a Free State, which infuriated Poland even more. In March 1934 Poland threatened to take Danzig back by force by mobilizing it’s troops, and threatened them again in 1938. In the Summer of 1939 Poland entered into an agreement with Britain and France to defend each other as and when required; conflict was only around the corner at this stage as Germany had signed a non-aggression Treaty, (known as the Molotov-Ribbentrop Pact) with the Soviet Union to ensure that the Soviets would not engage in conflict with Germany. Under the Treaty Germany was allowed to send every two years one of it’s warships into the harbour at Danzig and in 1935 and 1937 a light cruiser visited. On 25th August 1939 it sent an old de-commissioned battle cruiser called the Schleswig Holstein on another one of it’s ‘goodwill’ missions and it anchored. On the 1st of September 1939 the Schleswig Holstein opened fire on the Polish Fortress within the harbour and World War II began at Danzig. “Soldiers of the Westerplatte, fight! You are fighting the fight of Poland. Poland watches your gallant struggle with pride. Fight for Poland to the last man”. Marshal Smigly Rydz, Marshall of Poland and Commander-in-Chief of Poland’s armed forces. Two days later England declared War on Germany. Despite resistance at Westerplatte and by the Polish Post Office workers who refused to allow the Germany to take over their post office (and were subsequently murdered by the SS firing squad), Danzig was under strict martial law and occupation by the Third Reich. This entry was posted in WW2 Articles and tagged 1939, danzig, gdansk, hitler, invasion, poland, polish post office, schleswig holstein, start, start of ww2, third reich, treaty of versailes, westerplatte, WW2. Bookmark the permalink.